Vice President Mike Pence and NASA Administrator Jim Bridenstine called up to the Expedition 58 crew today from NASA Headquarters Space Operations Center in Washington, D.C..
Vice President Mike Pence and NASA Administrator Jim Bridenstine called up to the Expedition 58 crew today. 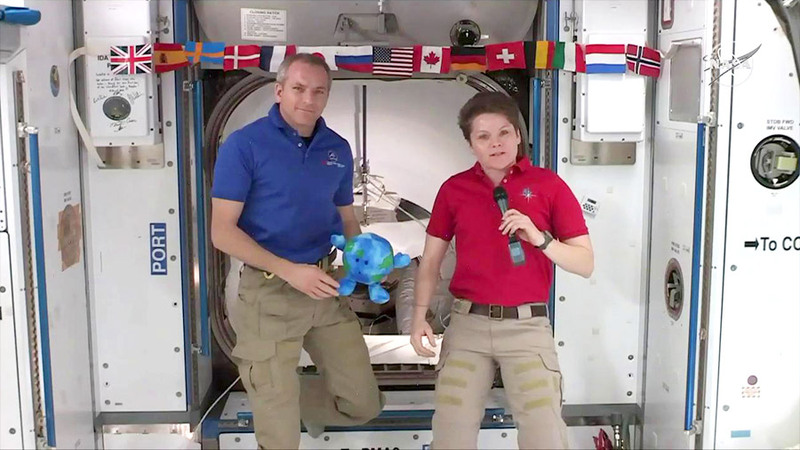 Astronauts Anne McClain and David Saint-Jacques were on hand to talk about their mission success and the arrival of the first Commercial Crew vehicle, the SpaceX Crew Dragon. The Crew Dragon is being packed and readied for its return to Earth on Friday. In the midst of NASA’s first Commercial Crew mission, the crew members continued more space research and practiced an emergency drill today. Saint-Jacques of the Canadian Space Agency transferred cargo in and out of the Crew Dragon today. Over 300 pounds of science gear, crew supplies and station hardware will be retrieved from Dragon after it returns to Earth. The Crew Dragon will undock Friday at 2:31 a.m. EST from the Harmony module’s international docking adapter. It will parachute to a splashdown in the Atlantic Ocean around 8:45 a.m. EST. NASA TV will cover all the activities live. 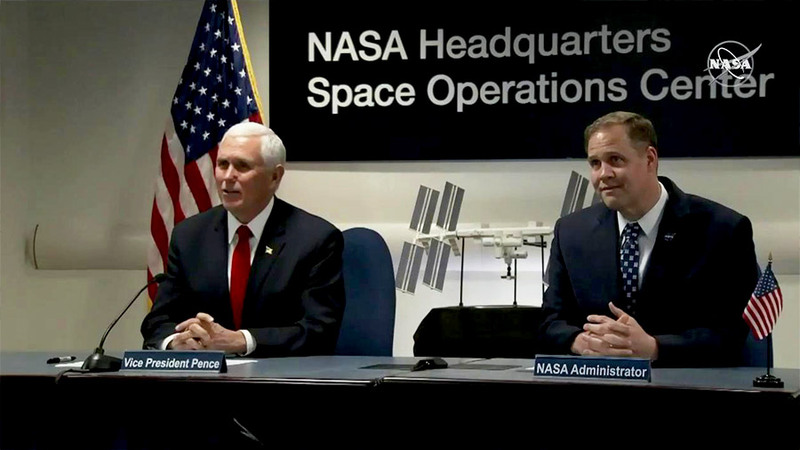 Astronauts David Saint-Jacques (left) and Anne McClain talk to the Vice President and NASA Administrator about their mission success and the arrival of the SpaceX Crew Dragon. McClain from NASA worked in the Destiny laboratory module today stowing science hardware after working on the Microgravity Sciences Glovebox. She then began collecting and readying more experiment hardware that will test ways to improve the production of higher-quality semiconductor crystals. Both astronauts then joined Commander Oleg Kononenko from Roscosmos to practice an emergency evacuation of the International Space Station. The trio wore breathing masks, entered the docked Soyuz spacecraft and prepared for a return to Earth in the unlikely event of a critical emergency aboard the orbital complex.